Airport workers are exposed to numerous hazards. 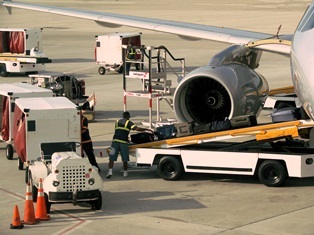 According to the Bureau of Labor Statistics, air transportation workers experienced 6.7 cases of nonfatal workplace illnesses and injuries per 100 full-time equivalent workers during 2016. That’s more than double the average rate of 2.9 injury cases for all private industry employees. Every job in the air transportation industry involves serious risks. Repetitive strain injuries. Employees must frequently reach for and lift numerous pieces of heavy baggage. This strains the back, neck, arms, and shoulders, leading to spinal issues, tendonitis, shoulder injuries, and torn rotator cuffs. The constant handling and gripping of luggage can also cause carpal tunnel syndrome. Hearing loss. Exposure to noise from airplanes, refueling vehicles, and baggage handling equipment can cause hearing loss, leading to stress, depression, fatigue, and insomnia. Shift-Work Disorder. Flight attendant schedules can change radically from one week to the next, and some flights may require attendants to stay awake for long periods of time. This can lead to shift-work disorder, causing numerous health problems such as diabetes, obesity, gastrointestinal disorders, and cardiovascular disease. Workplace stress. Flight attendants must cope with demanding passengers and security threats, with the resulting stress leading to sleep disturbances, hypertension, and gastrointestinal problems. Neck and back injuries. In-flight turbulence or a rough landing can cause neck and back injuries when a flight attendant is thrown into a wall or falls down. Pushing and pulling food and beverage carts can also strain muscles and tendons. If you were injured while working in the air transportation industry, you’re entitled to receive workers’ compensation benefits. This may include payments for lost wages, medical bills, disability, and vocational rehabilitation. You need an attorney to protect your rights and help you receive the compensation you deserve. To learn more, contact the law offices of Steve M. Lee, P.C., by clicking the Live Chat button on this page.